E-business has developed due to the fast penetration of the Web to human activities ranging from work and education to news and entertainment. The power of the Web is in its universality, and, in principle, everyone can access e-business websites and benefit from available information, products and services. However, in practice, universal access to the Web - and subsequently e-business websites - is not merely an issue of availability or technical development. Web accessibility emphasizes the incorporation of requirements of people with special needs to the design of Internet applications. Notwithstanding these requirements, the spectrum of accessibility concerns is even larger, for example if we think about the changing form of the computer and how people work and communicate: access is not required only from a PC, but also users are on the move and use other access devices (in terms of both hardware and software). 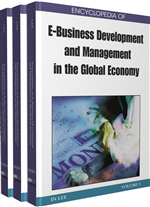 E-business has developed due to the fast penetration of the Web to human activities ranging from work and education to news and entertainment. The power of the Web is in its universality, and, in principle, everyone can access e-business websites and benefit from available information, products and services. However, in practice, universal access to the Web - and subsequently e-business websites - is not merely an issue of availability or technical development. Web accessibility emphasizes the incorporation of requirements of people with special needs to the design of Internet applications. Notwithstanding these requirements, the spectrum of accessibility concerns is even larger, for example if we think about the changing form of the computer and how people work and communicate: access is not required only from a PC, but also users are on the move and use other access devices (in terms of both hardware and software). Research on Web accessibility has produced a wide range of results that are also used in mainstream Web design to promoted good design practice. These can be briefly outlined in terms of related legislation that aims at encouraging the development of accessible Web applications, open recommendations for accessible Web design, various accessibility evaluation tools that check – to some extend - the conformance of websites to the aforementioned specifications and various related open standards that promote accessibility. Despite the large amount of work on Web accessibility, the vast majority of e-business websites are still not accessible. A report of accessible Internet shopping (Shindler, 2003) which involved 17 major high-street companies concluded that after the companies attempt to make their online shopping facilities accessible to people with disabilities during the period between August 2000 and June 2003 only five companies out of the seventeen examined, managed to pass the Watchfire Bobby test. The study of Loiacono and McCoy (2006) on evaluating Web accessibility in a large number of websites indicates that a poor 23% of federal homepages are accessible, while this percentage falls down to 11% for non-profit organisations and a totally disappointing 6% for corporate homepages. Propose measures for reaching and maintaining a good level of Web accessibility in terms of the specifications, design and evaluation phases of a user-centred approach to systems development. The proposed measures provide practical guidance to e-business applications stakeholders including managers, designers and developers. Web accessibility policy: a set of practices for the design, development and update of a website that ensure that Web accessibility is maintained through time. Web Accessibility: accessibility of (any type of) a website. Inclusive design: or Design for all: the practice of designing for all people as potential users, thus including the requirements of people with disabilities. User testing of Web accessibility: a generic category of accessibility evaluations that mainly includes user interaction with the web site and recording of accessibility flaws. Expert (manual) Web accessibility inspection: a generic category of accessibility evaluations that mainly includes experts that review a website for accessibility flaws on the basis of their knoweldge fo accessibility and with reference to accessibility specifications. People in handicapping situations: people that face temporal disabilities mainly due to factors related to temporal injuries, the access context or the environment in which they are situated in. Accessibility: the property of a designed artifact to be usable, manipulable and undestandable by all people regardless temporal or permanent injuries or disabilities. Accessibility specifications: an organised, validated and testable set of (among others) principles, guidelines, techniques, examples that have to be followed by design practitioners to ensure accessibility.